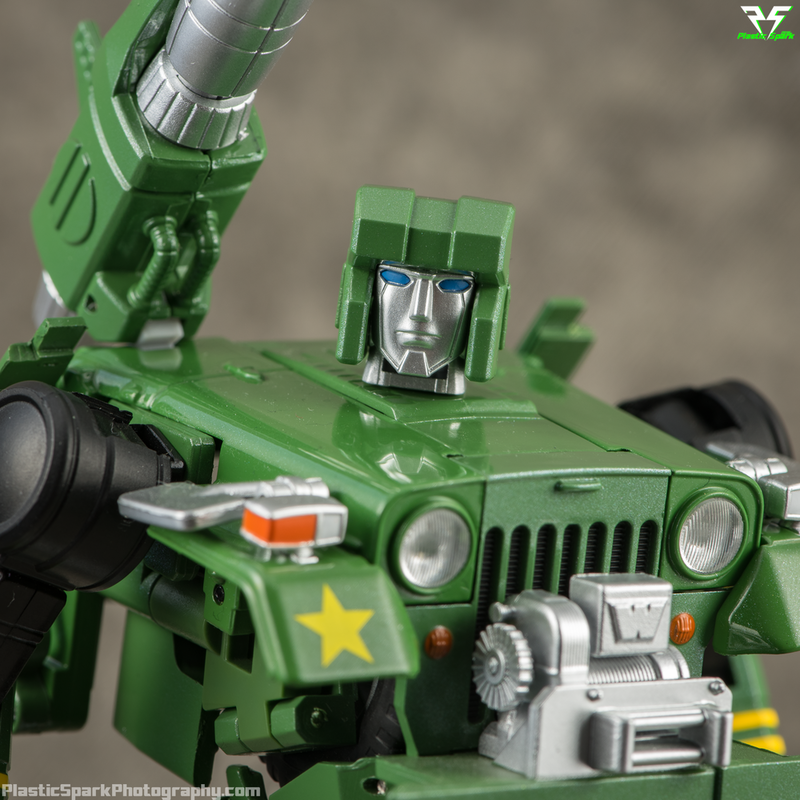 Fanstoys continues their Masterpiece focused line with FT-15 Willis, an homage to the G1 Transformers character Hound. 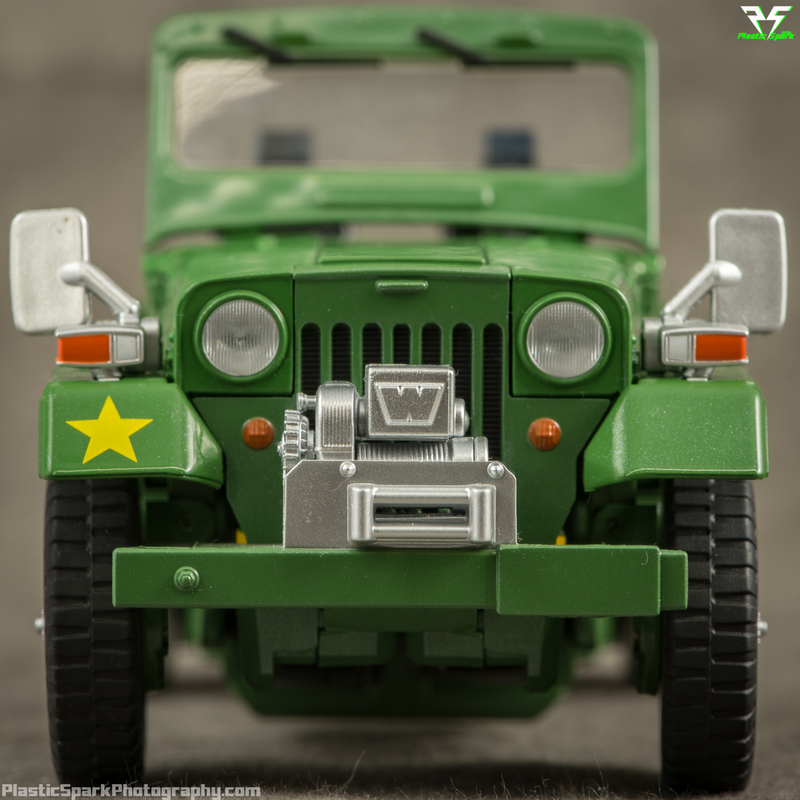 Willis is a fantastic looking figure taking cues from Hounds animation model, original toy, and his real life alt mode counterpart the Mitsubishi J59 Willys 4x4 vehicle. 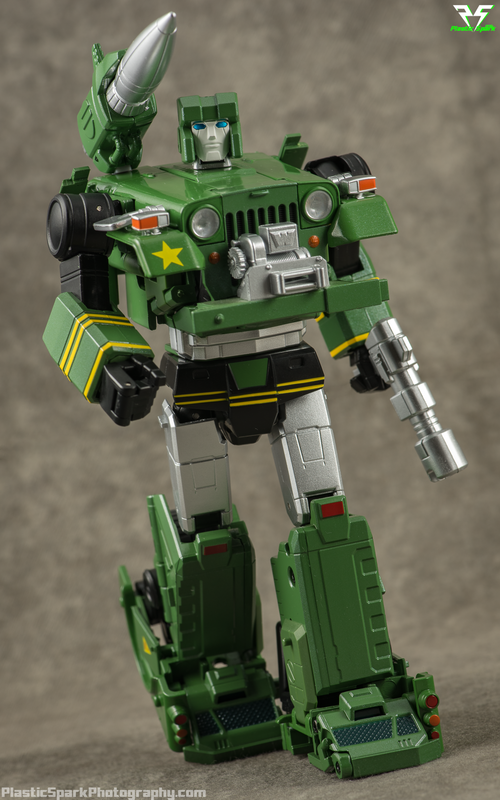 Hound is a core member of the season 1 crew and has been on many MP collectors want lists for quite some time. Fanstoys beat Takara to the punch and I think they've done a pretty exceptional job. Let's take a closer look at FT-15 Willis! 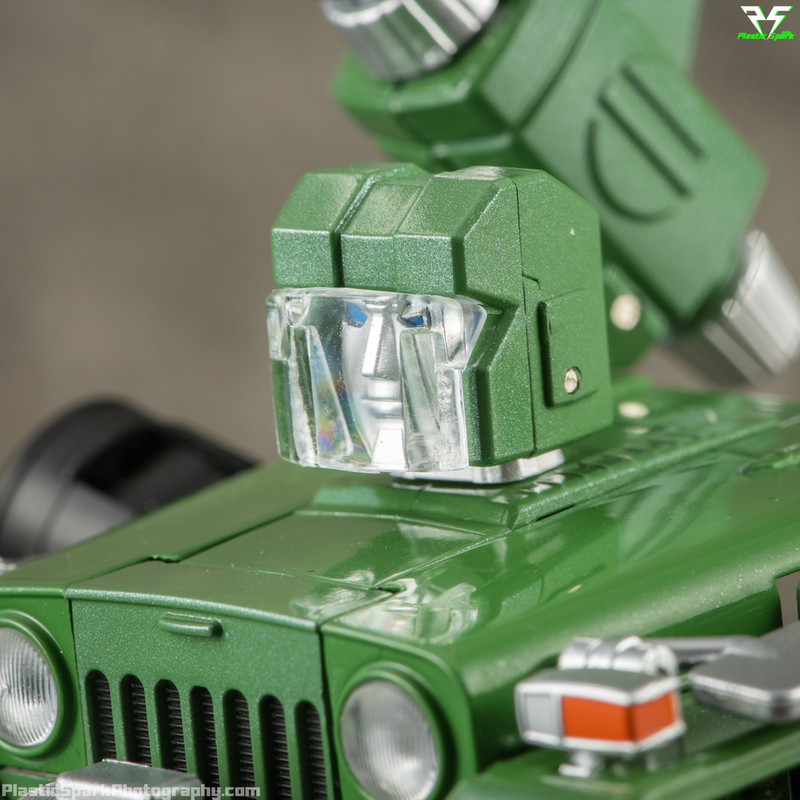 Willis has one of the most detailed vehicle modes I have ever seen in an official or third party toy. He looks phenomenal and I really can't think of a single thing I don't like about this mode. Even the interior of the jeep is highly detailed with a steering wheel, seat belt mounts, and even a removable gear shift! He is heavy too with a ton of die-cast that really gives a great hand feel. The metallic green paint is fairly uniform between the plastic and die-cast pieces with no obvious separation visible. There are a few seam lines from transformation but most of them occur in natural looking locations keeping Willis from looking like a puzzle more than a vehicle. 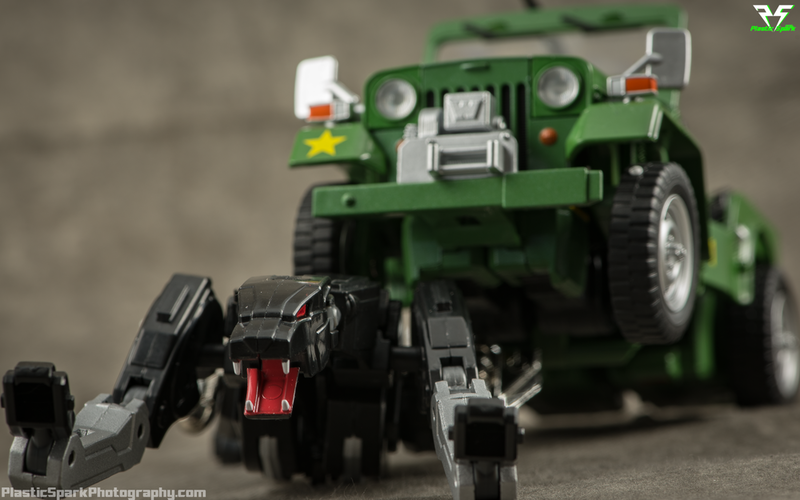 Rubber tires and painted rims look and feel fantastic and the addition of the power winch on the front really finishes off the vehicle mode in the perfect way. "I'm ready to sniff out those Decepti-creeps Prime!" The gas can and spare tire are clipped onto the rear lip and can be removed if you prefer a cleaner alt mode. The machine gun can also be removed. There is also a flip out post for pulling a trailer, I'm unsure if this is intended to be used with any specific accessory or just included for the sake of vehicle mode accuracy. All considered I couldn't be happier with this vehicle mode. 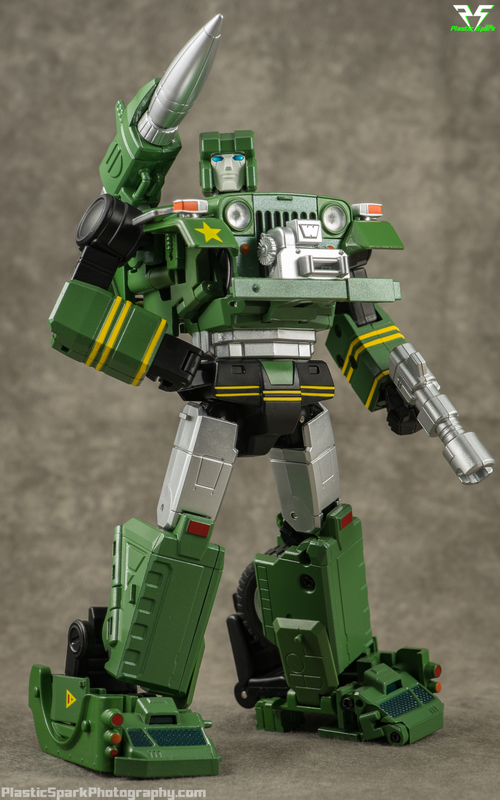 Fanstoys really knocked it out of the park here. Mitsubishi J59 Heavy Arms Custom Ver. Willis has a bit of a frustrating transformation the first couple times but it doesn't take long to figure him out. There are a few moments where I feel clearance could have been improved, especially when it comes to flipping the front tires into his chest. Be very careful folding down his mirrors, push them at the base rather than up top or you might break them. "I'm detecting signs of nostalgia in this reviewing unit"
Willis looks incredible in robot mode. There's no sense in beating around the bush this is truly a Masterpiece on par or possibly even exceeding some of the official products we have received in the line. 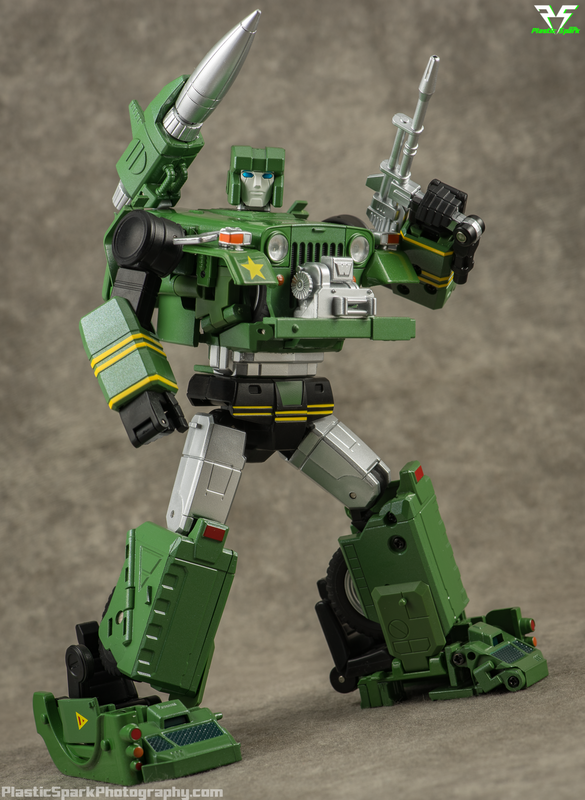 Fanstoys have perfectly captured G1 Hound to a level that almost feels strange for a third party product. The distribution of die-cast between the chest and feet is excellent and he has no issues balancing or posing. Real scary Hound... what are you gonna do project a movie on me? In the original solicits I didn't care for the head/face design but in person I actually find he looks quite striking. I especially like the included secondary head with the white painted face. That's the one I went with on my shelf. I also thought the feet looked a bit strange in the original photos and while I still don't think they are perfect, they are much nicer in person than I was expecting. Willis' articulation is simple but effective. A bit of a step down from Fanstoys usual offerings. Let's go top down and we'll go over all the points of articulation. His head is on a 2 axis swivel similar to most other MP figures, allowing for full rotation 360 degrees and a fair amount of up and down tilt. No side to side tilt as there is no ball joint. He rotates 360 degrees at the shoulder as well as an outward movement just over 90 degrees. This combination allows you to get his arm into pretty much any position you might need. As with transformation, be careful with the mirrors while manipulating his arms. His wrists rotate 360 degrees and he has single hinged hands with all 4 fingers on one pin at the base. "I swear I'm just an explorer!" He has an uninhibited waist swivel allowing for a full rotation. Hounds hips are a bit of an issue for me. He can swing his legs out to the side a full 90 degrees allowing for a full flat on the ground split, however due to the pelvis/waist design his front leg movement is limited to about 45 degrees. This is unacceptable especially from a well established company like Fanstoys. I can not understand why the waist doesn't have hinged flaps to allow a full 90 degree swing out of the leg. This limitation keeps him from kneeling and sitting as well as a few other poses. This might not be an issue for your average collector who displays in bot mode but for a photographer like me this is a travesty. 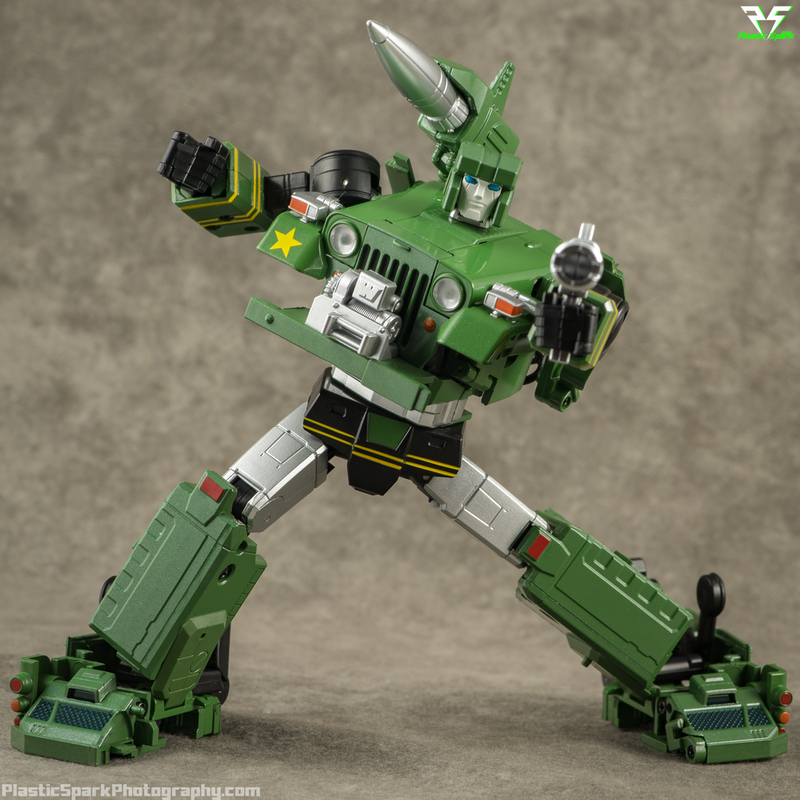 Hound is a tracker and he can't even kneel down on the ground to look for clues... His knees are double jointed due to transformation and give you about 110 degrees of bend which is nice and would have been an excellent pairing with proper hip clearance. The feet are no surprise if you've handled a Fanstoys product before. Excellent inner ankle tilt with 0 outward tilt, and a toe tilt that can bend up only. I have heard some reports of loose ankles causing him to lean forward or back, mine seem to be OK but they are just a tad loose. He actually has a pretty intimidating look for an Autobot. Willis' painted details are clean and well thought out. The yellow stripes on the pelvis and forearms look great! Red painted details on the knees and feet add a nice premium feel and the included yellow star on his right front fender is a nice detail that is usually left for companies like Reprolabels to fill in. Who's a good doggy? Who's a good doggy? You are! I am really bugged by the hip limitations but otherwise I do think this guy is a nearly perfect Hound. If they just had hip flaps instead of a solid piece on there I would say this guy is near flawless. I don't think the hips are a reason to pass on this figure but it is something that you should know about before picking him up. 1 x Rocket Launcher – Hounds trademark shoulder mounted rocket launcher. The launcher is well detailed with nice shiny silver paint on the rocket. It clips into a small space on either side of Willis' head. 1 x Hologram Projector Gun – Another of Hounds signature weapons, the Hologram gun is an incredible recreation based on Hound's G1 animation model weapon. It fits into his hands via the typical MP style tab and slot and fits securely without any issues. 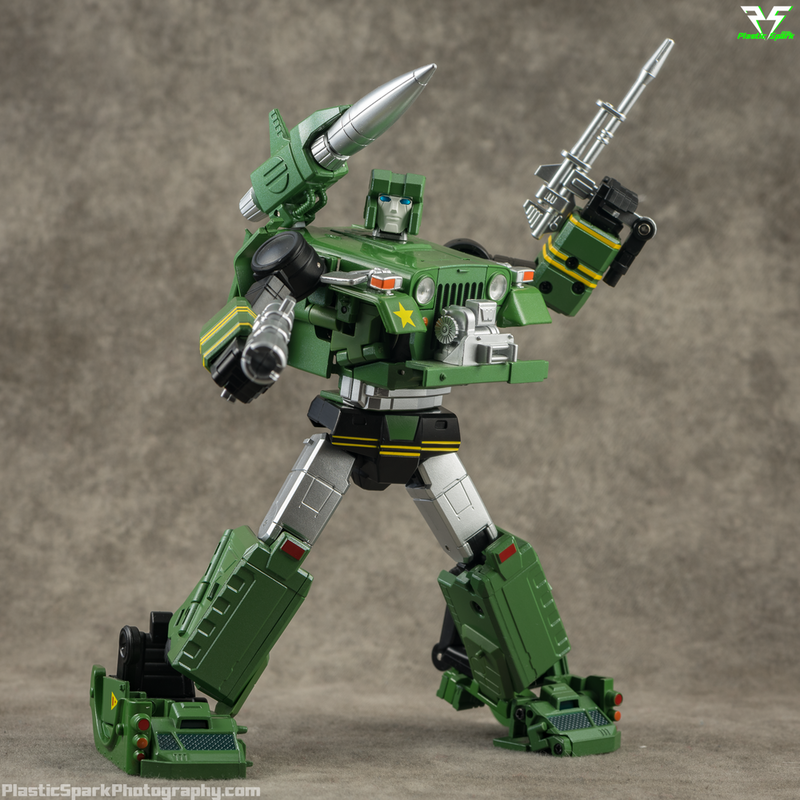 1 x Rifle – A simple painted silver rifle/blaster based on the original G1 toy weapon for Hound. Tabs in the same way as the hologram gun. It also has a non removable piece on the bottom of the handle to allow it to clip into vehicle mode. 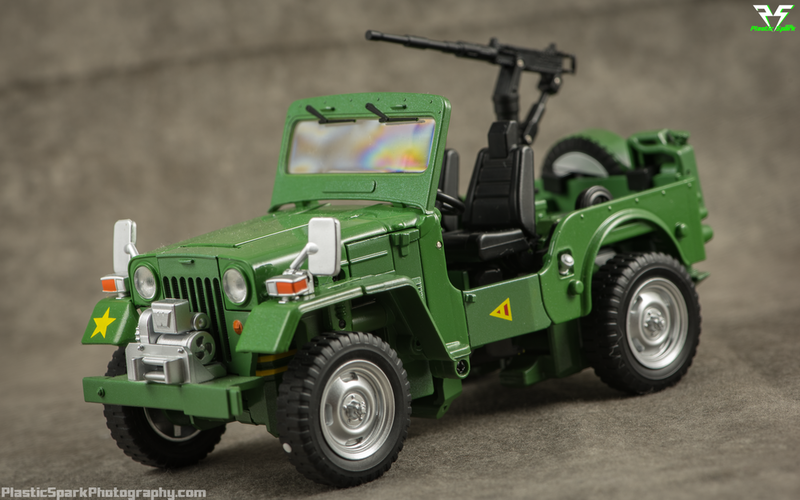 1 x Vehicle Mode Machine Gun – A single color machine gun designed for vehicle mode. Doesn't really have any home in bot mode. 1 x Gas Can – Clip on gas canister for vehicle mode. It can also be mounted on Willis' back in bot mode. 1 x Spare Tire - Clip on spare tire for vehicle mode. It can also be mounted on Willis' back in bot mode. 1 x Gear Shift Console – A clip in console piece for vehicle mode to add a gear shift. 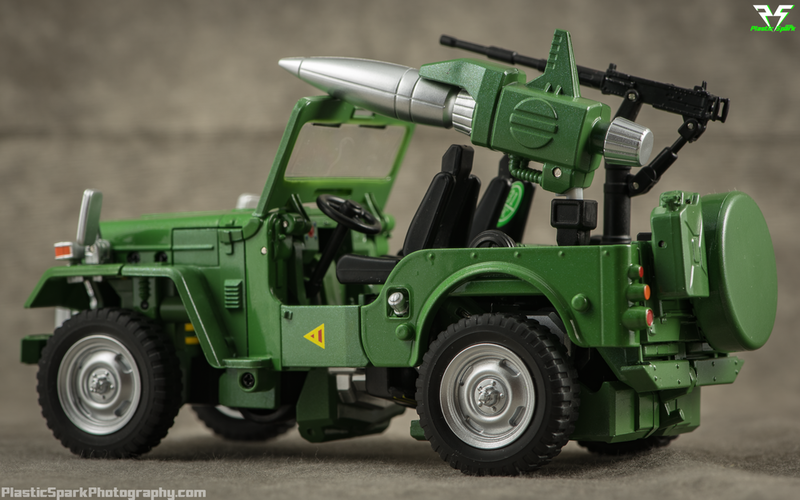 1 x Vehicle weapon mount – A black plastic mounting peg that allows you to mound Willis' rocket launcher in vehicle mode. 1 x Scuba Visor – Based on Hound's underwater visor from Season 1, Episode 2 of the original G1 TV series. "Bad Mr. Whiskers! Get off!" Despite his slightly limited articulation I feel that Fanstoys FT-15 Willis is the top of the heap right now for a Masterpiece Hound that fits in with the current MP collection. There are other options from Maketoys and TFC but if you are looking for cartoon accuracy Fanstoys is the way to go. The amount of die-cast metal on this figure is astounding and he feels spectacular in hand. He comes with a ton of accessories and display options, more than satisfactory for the asking price of less than $100. I absolutely would recommend him to anyone looking for a Masterpiece Hound but he isn't perfect. 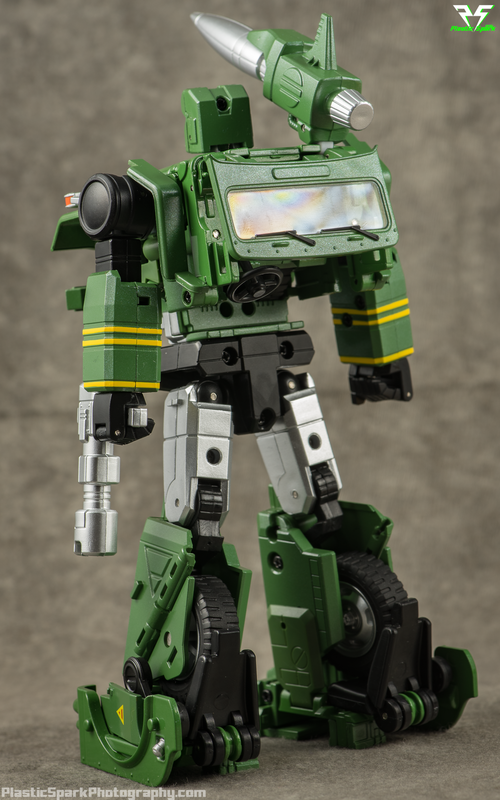 I think Willis is going to be a hard toy to beat but I am curious to see what an official version of Hound might look like in the future. I got mine from Blast Off Toys / Urban Pop Shoppe, but he is available from most online and local 3p retailers.